Hundreds of onlookers lined the streets of Sidney during the 2011 Winter Wonderland Parade. 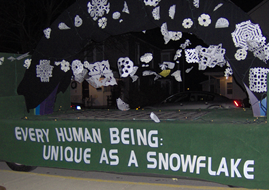 Right to Life sponsored a float with the message, "Every Human Being: Unique as a Snowflake." The float was decorated with white lights and dozens of paper snowflakes cut out and contributed by schoolchildren in the area. We're grateful for the support of the Sidney and Shelby County communities, which enables us to continue to promote life-affirming messages in every season. 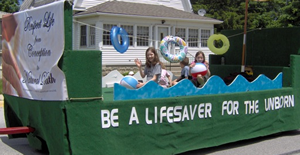 Right to Life's 2011 summer float featured a beach theme and the message: "Be a Lifesaver for the Unborn." The float appeared in Versailles, Botkins, Anna, and Sidney Applefest. It won third place for organizations at the Botkins Carousel. Thank you to all those who helped with the float this year.